Biofreeze® Pain Reliever is the most frequently used and #1 recommended topical pain reliever by hands-on healthcare professionals. For over 18 years, Biofreeze products have been helping people manage their discomfort by offering a variety of benefits that assist in exercise, training, pain relief, therapy and overall comfort. 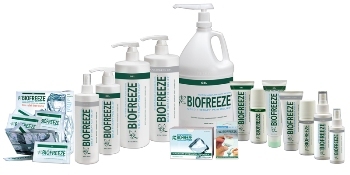 Using natural menthol as the active ingredient, Biofreeze products provide temporary relief of minor aches and pains.